The aircraft carrier USS Ronald Reagan (CVN 76) transits the Pacific Ocean with ships assigned to Rim of the Pacific (RIMPAC) 2010 combined task force as part of a photo exercise north of Hawaii. Hawaii's relationship with the US military goes back to 1893 when US marines overthrew the sovereign kingdom ruled by Queen Liliuokalani. Always a major military base for the US in the Pacific, under Barack Obama the islands are set to play a vital role in his "Asia-Pacific Pivot". The announcement of America’s “Asia-Pacific pivot” by its first Hawaiian-born president was highly fitting, since the Hawaiian Islands are at the piko (“navel” in Hawaiian) of this vast region. A less flattering metaphor for Hawaii’s role in the Pacific is what Maui educator and native Hawaiian activist Kaleikoa Kaeo has called a giant octopus whose tentacles reach across the ocean clutching Japan, Okinawa, South Korea, Jeju island, Guam—and, at times, the Philippines, American Samoa, Wake Island, Bikini Atoll, and Kwajalein Atoll in the Marshall Islands. The head of this beast is in Hawaii, which is home to U.S. Pacific Command (PACOM), with sonar, radar, and optical tracking stations as its eyes and ears. Its brain consists of the supercomputers on Maui and the command center on Oahu that connects PACOM to distant bases. This octopus excretes waste as toxic land, polluted waters, abandoned poisons, blown-up and sunken ships, and depleted uranium (DU). Like a real octopus that can regenerate severed limbs, the military in the Pacific grows in new locations (Thailand, Australia) and returns to old ones (Philippines, Vietnam). PACOM headquarters at Camp H.M. Smith on Oahu is a short drive from Waikiki Beach, but it’s unlikely many tourists pause to consider that tensions between the United States and Russia over missile defense, the war in Afghanistan, the destruction of Iraq, the use of drones in Libya, Somalia, Yemen, Pakistan, and the Philippines—as well as growing opposition to military bases in Okinawa, Guam and Jeju—are all linked to Hawaii. Hawaii’s relationship with the U.S. military was cemented on January 16, 1893, when U.S. Marines overthrew what had been a sovereign kingdom recognized by the United States and dozens of countries around the world. Encouraged by Anglo-American subjects of the Hawaiian kingdom seeking tariff-free access to American markets for their sugar cane, the U.S. military—pursuing what was then already a mission of expansion in the Pacific—toppled Queen Liliuokalani, making way for the 1898 U.S. declaration of the Territory of Hawaii and, in 1959, statehood. In 1900, President Theodore Roosevelt said, “I wish to see the United States the dominant power on the shores of the Pacific Ocean.” He and every president since have understood the importance of Hawaii in fulfilling that goal. “Our future history will be more determined by our position on the Pacific facing China than by our position on the Atlantic facing Europe,” Roosevelt said. Since even before World War II, but especially since the 1947 establishment of PACOM, Hawaii has been at the center of testing, training, and deployment of U.S. military hardware and personnel around the region. Today Hawaii is home to 118 military sites, from the Pacific Missile Range Facility on Kauai to Kaena Point Satellite Tracking Station on Oahu, from the Air Force Maui Optical and Supercomputing observatory to the Pohakuloa Training Area on the Big Island (Hawaii Island). On Hawaii Island, at 133,000 acres, Pohakuloa Training Area (PTA) is over four times the size of Kahoolawe. The high-altitude site between the volcanoes Mauna Loa and Mauna Kea has been used by all branches of the military for small arms training, mortar firing, and other live-fire tests. In addition to being shelled with millions of rounds of ammunition annually—and on the receiving end of 2,000-pound inert bombs dropped from B-2 bombers—PTA is contaminated with an undetermined amount of depleted uranium (DU). In 2008, the Hawaii County Council voted 8-1 for a resolution calling for a halt to live-fire training until further assessments and clean-up can be conducted. The military, however, continues to exploit the site, according to Jim Albertini with the Malu Aina Center for Non-violent Education & Action. “It isn’t just Pohakuloa. It’s Kahoolawe, Makua, Barking Sands, the proposed training on Maui and it’s Kalaupapa,” says Buchanan, talking about Kalaupapa peninsula, on the island of Molokai. Kalaupapa is a quiet place, best known for its 19-century leprosy colony at the bottom of Hawaii’s highest sea cliffs. Less well known is that Kalaupapa and “topside” (upper) Molokai are used by the Navy for confined area and field carrier landing “touch-and-go” training by CH-53D helicopters, the type used in Afghanistan. In July 2012, activists on Molokai helped thwart plans to increase night training exercises for the controversial MV-22 Osprey and Huey attack helicopters from 112 takeoff and landings per year to 1,388. The Navy plans to base two squadrons (12 aircraft each) of Osprey and one squadron of light attack H-1 Cobra and Huey attack helicopters in Hawaii. The Osprey, which takes off like a helicopter but can fly like an airplane, has been heavily criticized over safety concerns following at least seven fatal crashes—including two this year, in Florida and Morocco. Osprey helicopters have been used in Afghanistan, Iraq, and Libya, and they’re being deployed in Japan and Okinawa despite fervent protests. In addition to concerns about some 2,000 new active-duty personnel and their dependents being transferred to Oahu, civic and cultural groups are worried about the impacts of the aircraft on local communities, wildlife, and historically and culturally sensitive areas on Kalaupapa, which is designated a U.S. National Historic Park. The military has said the increased training will have “no significant impact on noise levels for most communities,” but local groups wedged between high cliffs, mountains, and the sea fear otherwise. An Asia-Pacific pivot will increase testing and training beyond what has taken place in Hawaii for years—from live-fire testing in Makua Valley on Oahu to missile defense, rocket, and drone testing at the Pacific Missile Range Facility on Kauai. 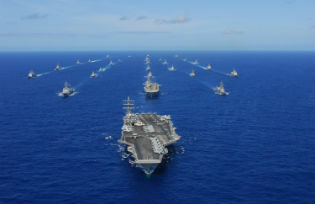 Additionally, every two years, the U.S. military holds its Rim of the Pacific (RIMPAC) training—the “world’s largest international maritime exercise,” which was most recently held this summer across the islands. RIMPAC 2012 included 22 regional allies (including Canada, Japan, Australia, South Korea) and more distant nations like Colombia, Netherlands, Tonga, India, and Russia. Notably absent was China, but in September 2012, U.S. Secretary of Defense Leon Panetta announced that Beijing would be invited to participate in a limited capacity in the 2014 exercise. Retired U.S. Army Colonel Ann Wright sees RIMPAC and the growing number of multi-national joint military “exercises and engagements” in the region as an opportunity for the United States to test (and show off) its next generation of weaponry: laser-fueled, computerized, and submarine-launched drones. It’s also a chance to closely assess regional capabilities while positioning the United States to more effectively “push around” other countries and persuade them to do the foreign policy and military operational bidding of the United States, Wright says. Wright, who resigned in protest of the 2003 invasion of Iraq, points to the South Korean naval base on Jeju which, when finished, will house AEGIS-equipped destroyers linked to U.S. missile defense as an example of how the United States pressures its allies to follow certain paths. Much has been made of the Asia-Pacific pivot, but Oahu activist Kyle Kajihiro of Hawaii Peace & Justice says this is just the most recent wave in a series of endless waves. “Every pivot needs a fulcrum in order to turn. Hawaii was the first fulcrum for U.S. in the Pacific and has allowed it to leverage their power to greater effect,” he says. Kajihiro points out that questions of land use and the military’s social, cultural, and environmental impacts on Hawaii are frequently overlooked or sidelined by the notion that seemingly endless infusions of money and military-based employment always trump the needs of people and the environment. In Hawaii, the military has widespread local support, even from some native Hawaiians (whose kingdom was overthrown), people of Japanese descent (who have suffered discrimination and internment) and others whose ancestral homelands have born the brunt of the U.S. military (Koreans, Okinawans, Chamorro, Pacific Islanders). Hawaii is a remote archipelago almost wholly dependent on imported oil, commodities and manufactured goods, but increasingly its people are recognizing the need to become more self-reliant, especially in terms of local food production. In the last decade Hawaii has seen a mushrooming of businesses and educational efforts to pursue alternative energy based on sun, wind, waves and waste. Author Richard Heinberg, a senior fellow in residence at the Post Carbon Institute, has suggested Hawaii should move in a direction like New Zealand, which places very little emphasis on military strength but has become a global leader in environmental conservation. Under the banner of an “Asia-Pacific pivot,” the United States is positioning its military to secure access to remaining resources and drive the economic and political winds of the region, but it also demonstrates that it understands the importance of finding alternatives to building large, new bases that rely on increasingly hard-to-obtain money and oil. In order to successfully secure a place for its people in a more crowded, resource-strained world, Hawaii would do well to pursue its own pivot away from militarism and instead shift its efforts to food and energy self-reliance, environmental protection, and planning for survival in a world beset by climate change. The sooner Hawaii recognizes that it would be better off with a drastically reduced dependency on the military, the sooner it can begin to move toward a healthier, safer, and more secure future. Jon Letman is a freelance writer and photographer based on the Hawaiian island of Kauai.